Have you ever been desperate to hear God’s voice? Has daily life ever felt so demanding you weren’t sure what to do next? Has your phone rung in the middle of the night with unexpected news about a loved one? Has the diagnosis from the doctor brought a sense of fear or unrest? Have you wanted an answer from God, but didn’t know where to turn? I’ve been there. When my son was arrested for a serious crime after I’d tried to be the best mother I could be, I felt alone. Angry. Hurt. Fearful. Disappointed in God. Those feelings intensified following his conviction and sentencing. Here’s what I began to learn. I needed to give myself time to grieve my losses. Maybe you’ve been there, too. I discovered it’s okay with God to cry out my pain and hurt. Our tears matter to Him. Then I started communicating with God in a new way. When life was intense or busy, it was hard to read an entire chapter of the Bible. But I discovered I could read a verse or two. I began meditating on those verses and praying, “Lord, what do you want to speak into my life as a result of this Scripture?” Then I started writing out what I believed was His prayer over my life. And it comforted me. It was as if God took me by the hand, as a father would guide a child, and gently led me in the direction of unconditional love, renewed hope, and fresh faith. You’ve been stressed and anxious about future events. There are work concerns and family issues, along with financial challenges. It’s hard to concentrate on what you have to do today, because you already know the week ahead is filled with impossible situations—and you’re not sure what you should do. Instead of worrying, talk to Me. I love to respond to your requests. Worrying about what hasn’t happened yet and about what might never happen is fruitless and only robs you of the strength you have today. You will find Me if you look for Me, and I will provide all you need in perfect timing. I am never late. As I continued to listen to God’s voice through His Word, I wrote out 365 prayers based on Scripture for every day of the year. 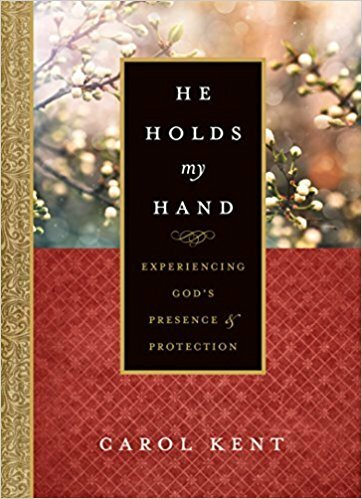 I hope you’ll be encouraged through these devotions in He Holds My Hand (Tyndale). Each day’s selection begins with a relevant quotation, followed by a prayer, and ends with a Scripture verse or passage. Listen to God’s voice and put your hand in His. He is your Comforter, your Healer, your Teacher, and your Joy. Whether life is good or unspeakably difficult, He holds your hand—and He won’t let go. Carol Kent is an international speaker and the bestselling author of When I Lay My Isaac Down and Becoming a Woman of Influence. With vulnerable openness, irrepressible hope, restored joy, and a sense of humor, she directs you to choices based on God’s truth. She annually directs the Speak Up Conference, training Christians in speaking and writing skills. 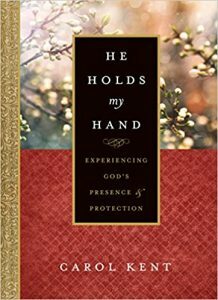 You can get information on her newest book, He Holds My Hand, or on inviting her to speak at your event at www.CarolKent.org. Connect with Carol on Facebook and on Twitter.